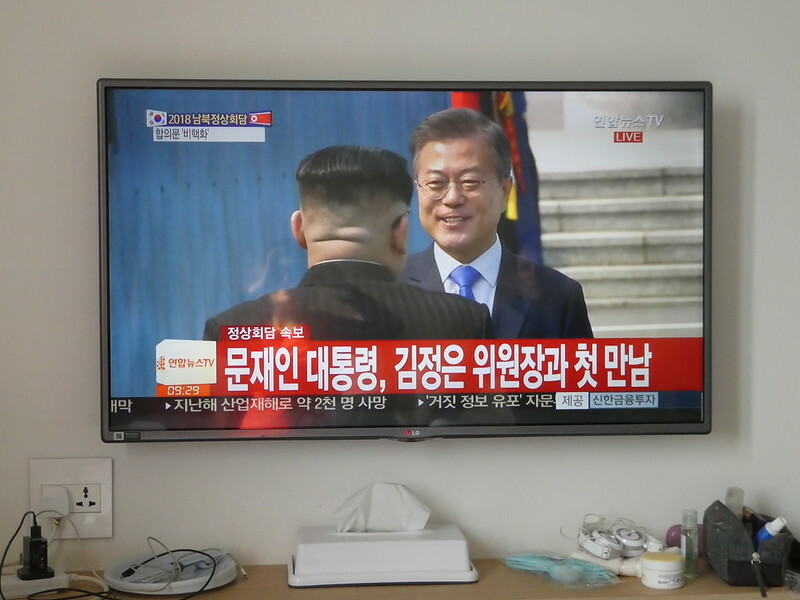 After a delicious hotel breakfast we returned to our room and turned on the television to watch live history being made when the leaders of both North and South Korea met at the DMZ. By 9.45 a.m. we had finished viewing and were ready to take the metro to Samseong in the Gangnam district of Seoul. Gangnam came to world fame following the release of the catchy tune ‘Gangnam Style’ by PSY, with its amusing dance moves that went viral in October 2012. It’s also Seoul’s most exclusive district full of gleaming skyscrapers and designer stores. Gangnam literally means ‘south of the river’ as it lies on the banks of the River Han. 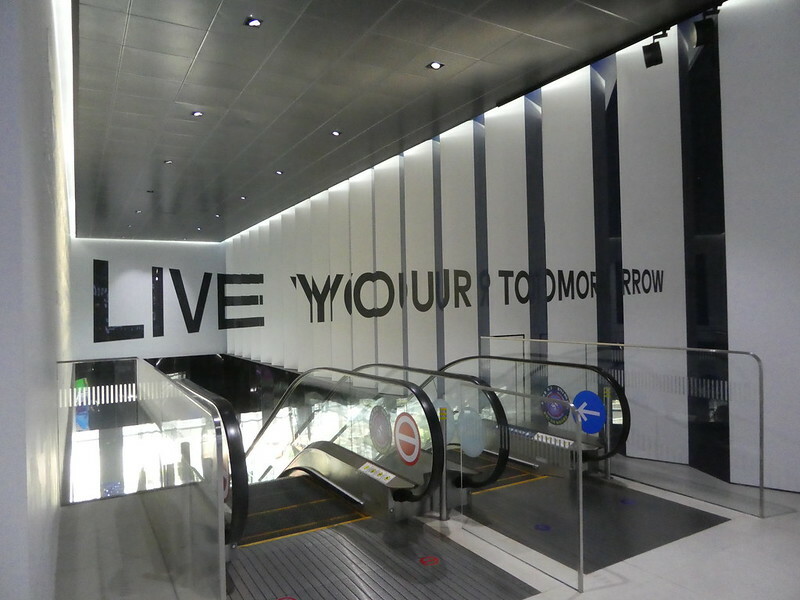 Our first stop was at the COEX Shopping Mall located beneath the Korean World Trade Centre. This is one of the largest underground shopping centres in South Korea and also includes an aquarium, cinema and even a kimchi museum. Located in its central plaza is the Starfield Library which looked stunning with its three 13m tall giant bookshelves packed with around 50,000 books and magazines although I’m not sure how you access some of them! 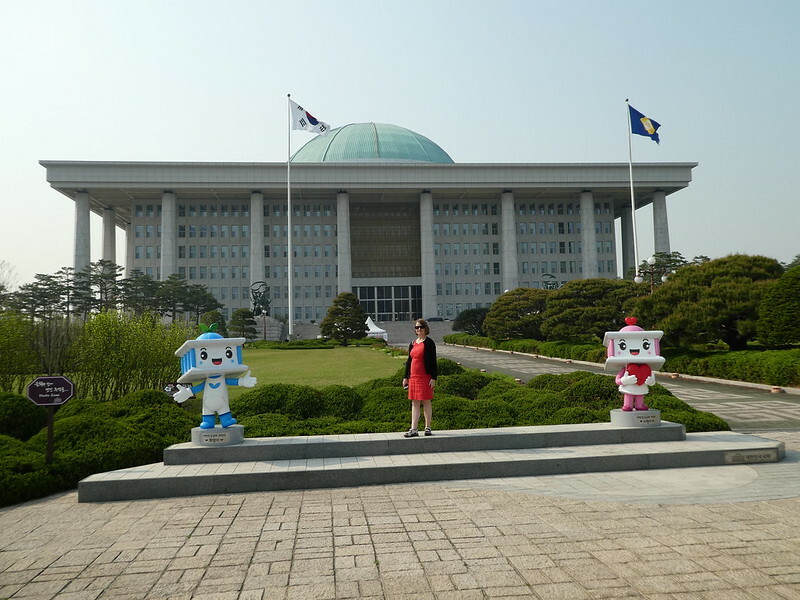 This library boasts Korea’s largest collection of magazines featuring over 600 titles from around the world. Its setting provides visitors with a relaxing environment with stylish chairs and reading tables and I could have easily settled down with a book if I hadn’t had other plans. 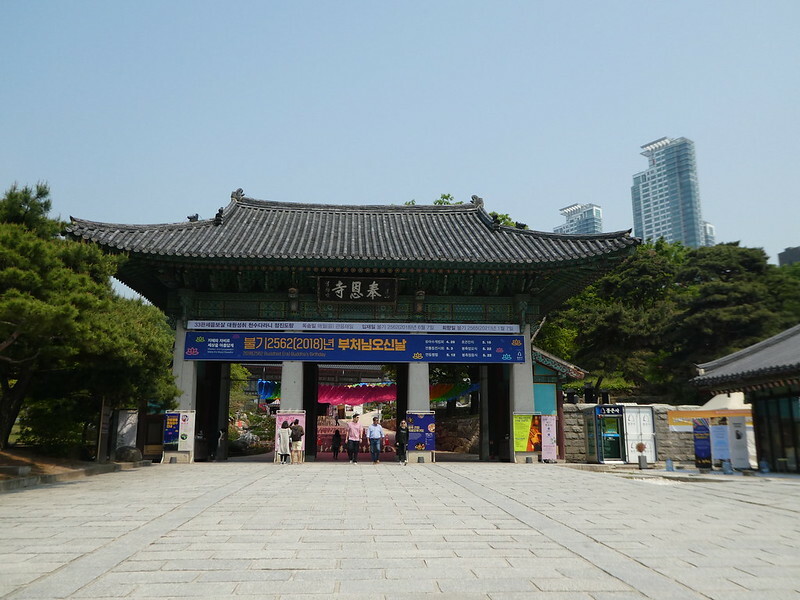 Leaving the stunning modern architecture behind, we crossed the road and walked north a short distance to the ancient, peaceful atmosphere of the Bongeunsa Temple. This temple was founded in 794 and is home to 3,479 Buddhist scriptures. Although some construction work was taking place, we enjoyed a stroll through the temple buildings which are scattered around a hillside awash with flowering azaleas. The centrepiece of the temple is a 28m (91ft) stone statue of Maitreya the Future Buddha. Visitors interested in learning about Buddhism can take part in a temple stay programme which we saw advertised at the entrance. 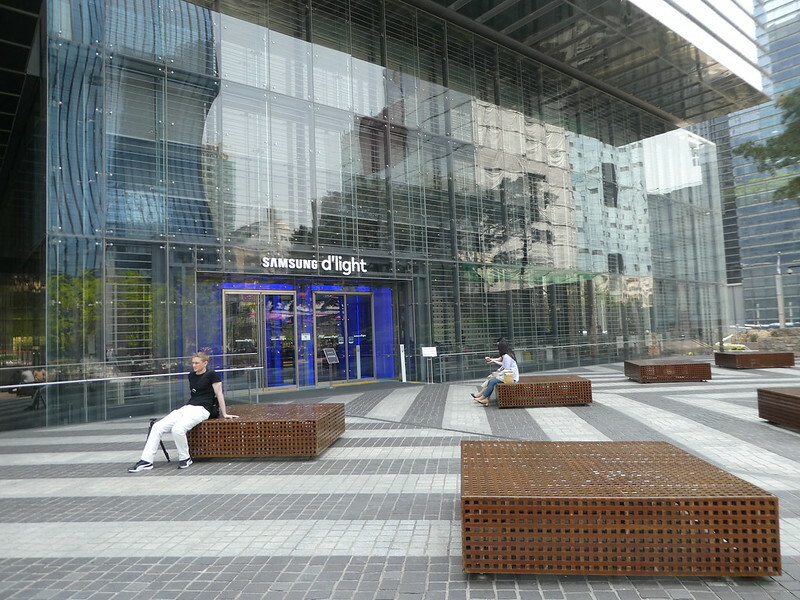 Continuing our tour of the Gangnam district, we hopped back on the metro to Sinnonhyeon as we wished to visit Samsung D’light, an exhibition space showcasing Samsung’s latest technology. Just in case you weren’t already aware, Samsung is a Korean company and has its headquarters here in Gangnam in the Samsung Electronics building. The name D’light combines the words digital and light as the company’s vision is to be a guiding light in the digital world. The exhibition is free to enter and is located on three floors with the ground floor being Samsung’s flagship store where its latest digital devices are on display. 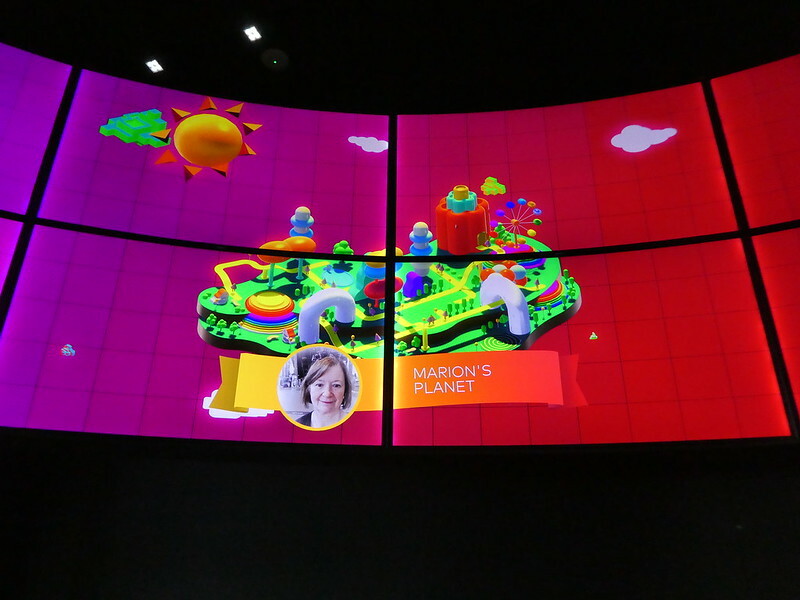 The first floor contains an exhibition space of Samsung’s technology and devices whilst the top floor is an interactive journey into the future utilising Samsung solutions. Entering D’light, we were handed wrist bands which we activated on touch screens. We then followed a series of interactive features through digital technology which was categorised by themes. This painted a picture of the type of people we were and was really fun to do, I was pleased with my outcomes which categorised me as insightful, calm and active – I hope this is true! 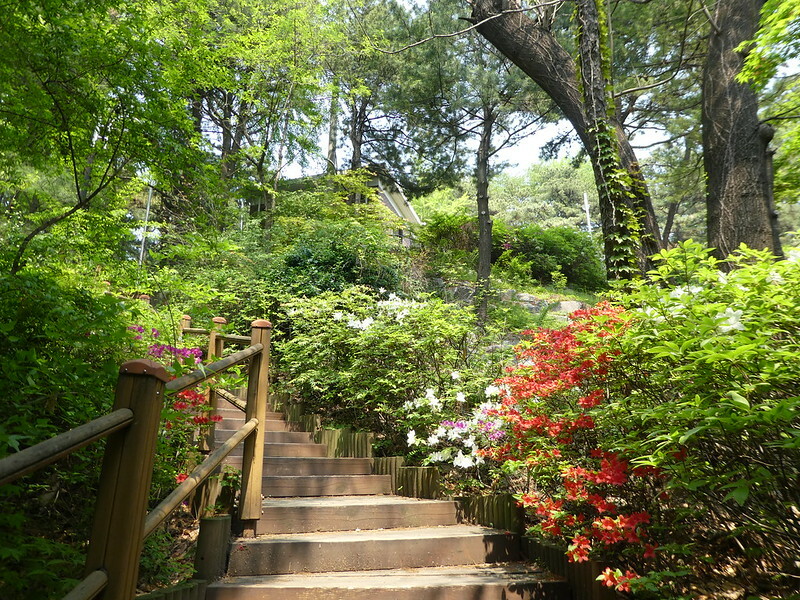 It was then time for a coffee and some window shopping in this affluent part of the city before climbing a steep hill to Yeoksam Park which looked beautiful with its flowering azaleas. 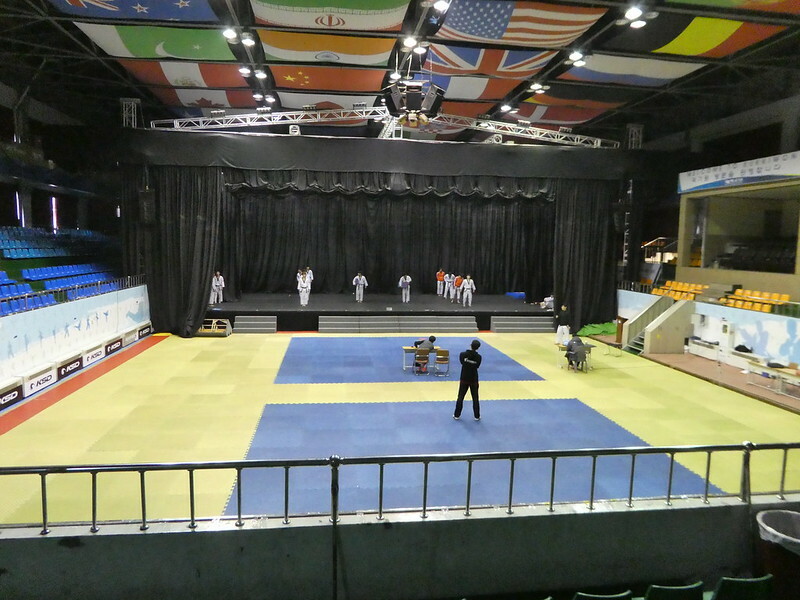 Located just above the park is Kukkiwon, the headquarters of the International Taekwondo Federation. Visitors are welcome to visit and admission is free. We were invited to take a seat in the main arena where a training session was taking place which we found interesting. This arena stages the world championships and various other competitions. After viewing for awhile, a member of staff came to ask if we would like to take a look in the adjacent Taekwondo museum. Visiting here, we learnt that the organisation was founded in 1972 to promote and encourage the growth of the Korean martial art. The museum contains equipment, clothing, trophies, posters and other memorabilia. It was interesting to learn that Taekwondo made its debut as a demonstration sport at the 1988 Seoul Olympic Games and became an official medal sport at the 2000 Sydney Games. 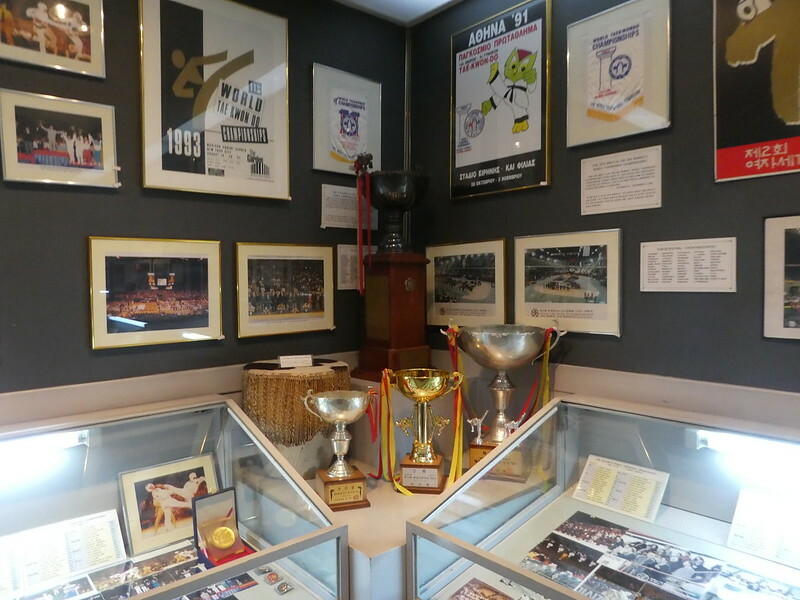 The museum featured displays of Olympic posters and medals covering the years that Taekwondo has been included. We were the only visitors to the museum at that time but I would recommend a visit even if, like us, you do not have any prior knowledge of this martial art. 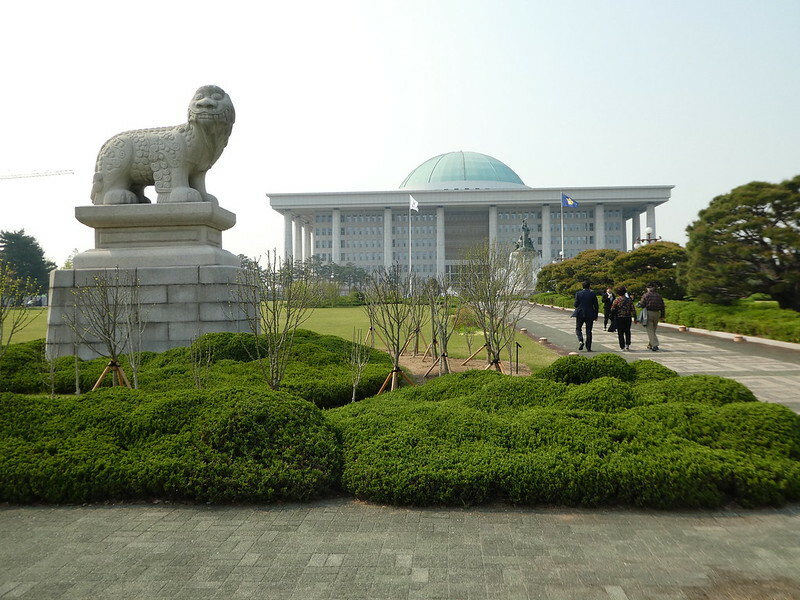 We had become so engrossed in the museum that we hadn’t realised the time so we needed to dash back to the nearest metro station at Sinnonhyeon as we had reserved places on a tour of the National Assembly at 2.00 p.m. Arriving at the National Assembly metro station, our required exit was the furthest away and on reaching ground level it was still quite a distance through the grounds to the Assembly Hall entrance. Rushing up the steps, we thought we were just in time as it was 1.59 p.m. but a security guard sent us back down the steps to an information point in the basement. Taking our printed ticket to the desk there, we were then informed that we needed to return outdoors and walk around the perimeter of the large building to the rear entrance. We whizzed along as fast as we could but it was 2.15 p.m. by the time we were in the right place! A member of staff escorted us to the Plenary Chamber where we were shown to seats in the visitor’s gallery. 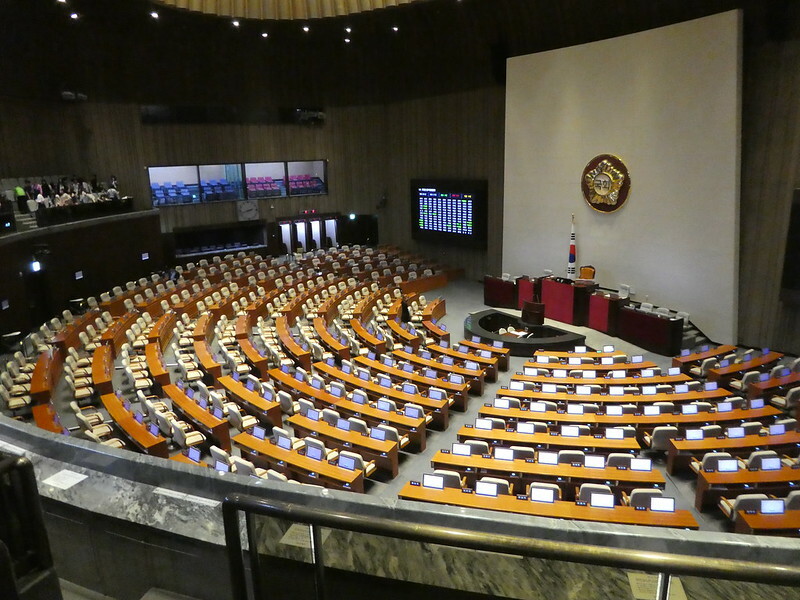 Most of the other visitors were school children and despite the talk being in Korean we managed as the guide demonstrated the use of the delegate’s screens and analysis of voting on the giant screens at the front. The chamber uses the latest technology and has very comfortable seating for 400. At the end of the presentation we had ample time to walk round and take photographs. The Hall is fan shaped and covers three floors. 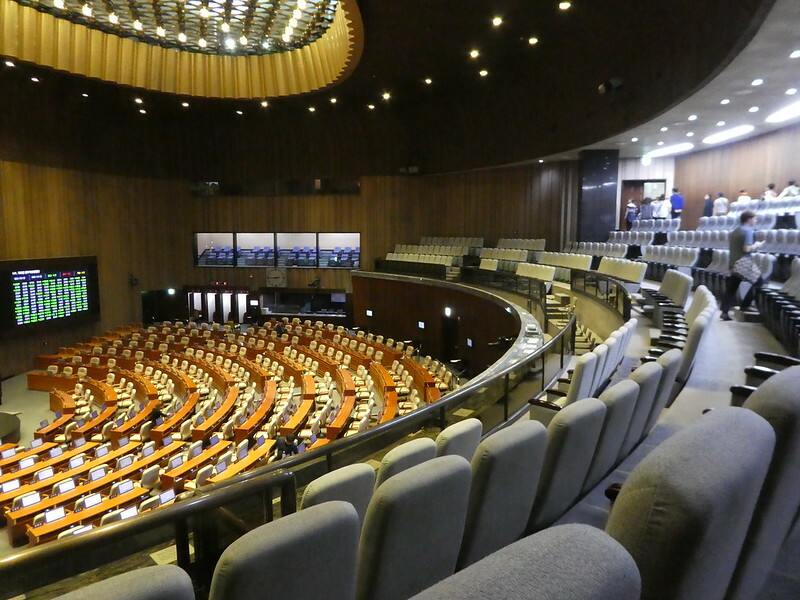 The speaker’s chair is located in the centre in the narrow part of the room and the delegates seats fan out from there. Afterwards, we found a small cafe on the ground floor where we settled down with cappuccinos whilst planning what to do next. 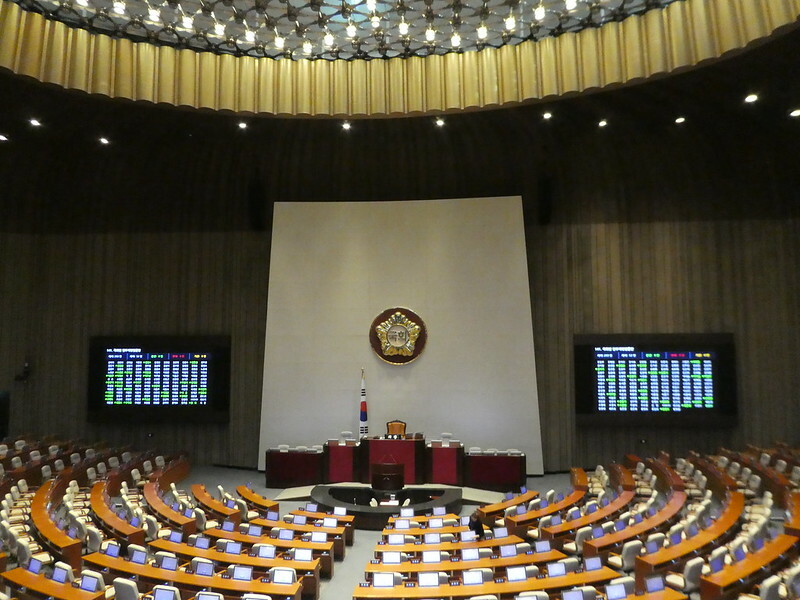 If you might also be interested in visiting the National Assembly, reservations which are free of charge, can be arranged in advance by email, details can be found here. Times of tours vary depending when parliament is sitting. Please remember to allow extra time for arrival and report to the information desk at the rear of the building bringing passport I.D. along with the printed ticket (there is no mention on the ticket advising visitors of the correct entrance). As we had rushed into the building on arrival we spent some time walking through the grounds. 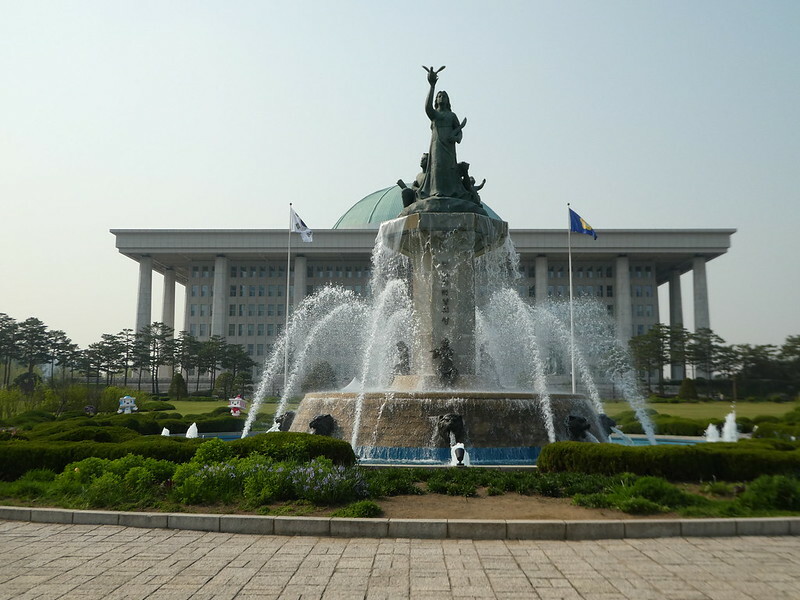 The National Assembly was completed in 1975 after six years of construction. The magnificent building with its white exterior and splendid blue dome has 24 granite pillars with its dome symbolising the various opinions of the public emerging as one. We then took the metro to Sinchon station so that we could visit the Yonsei University campus. Leaving the metro station by exit 2, we were tempted to buy some Korean fried chicken from a street vendor. The chicken was moist with a thinner, lighter batter and softer texture than we have eaten in the U.K. After finding a bench to eat our tasty snack we strolled along the long tree lined avenue through the Yonsei campus. 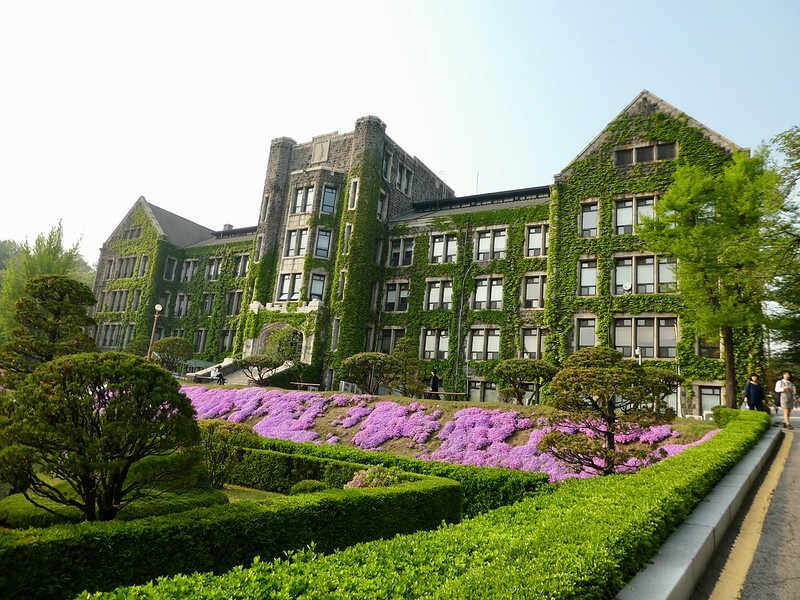 Yonsei is a public research university which was established in 1885 making it one of the oldest and most prestigious in the country. Approaching the far end we admired the beautiful, ivy clad historic buildings arranged in a parkland setting. Pictured above is the neo-gothic Underwood Hall now used as university administrative offices. 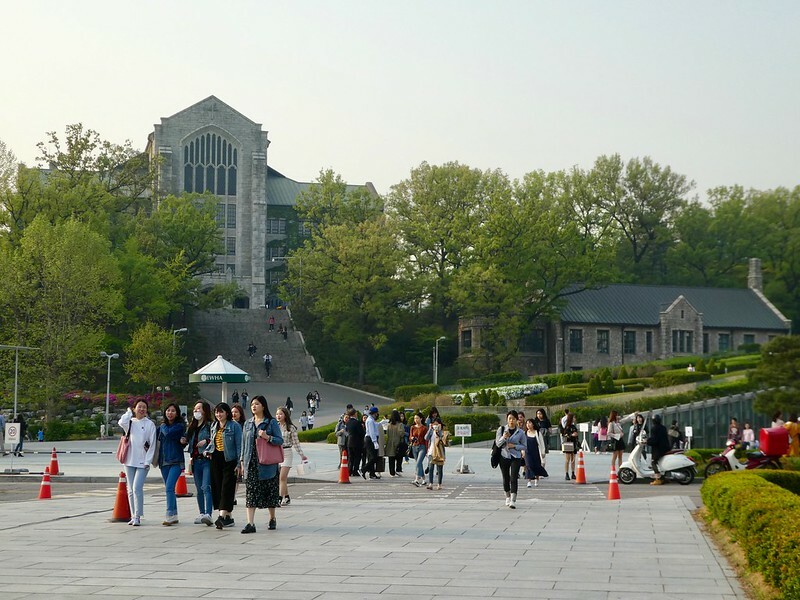 Besides it’s high reputation for teaching, learning and research, Yonsei is also regarded as having one of the most beautiful campus settings in South Korea. Continuing, we followed a narrow path through the natural woodland beauty of Seoul to the nearby Ewha Woman’s University which also has some lovely old buildings. 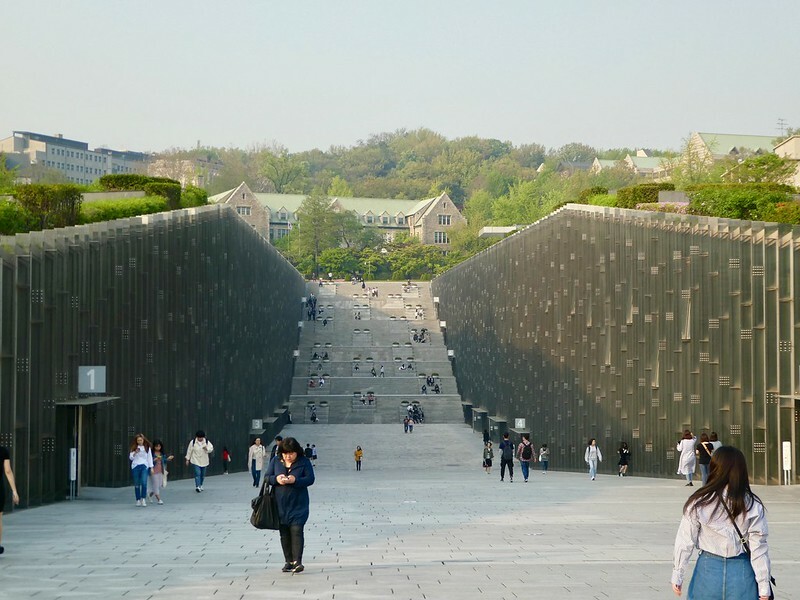 Dating back 120 years, Ewha is the leading women’s university in Korea. It’s ivy covered stone buildings around the campus testify to its long history. As well as its historic buildings the university contains a state-of-the-art underground complex. This includes bookstores, convenience shops, a cafe, restaurant and a theatre. Next, we returned to our hotel from Ewha Woman’s University metro station. After such a busy day we then enjoyed a well earned rest back in our room before setting out again on foot to Insa-dong for dinner. Here we met a retired Korean army officer and sat chatting to him whilst we ate. 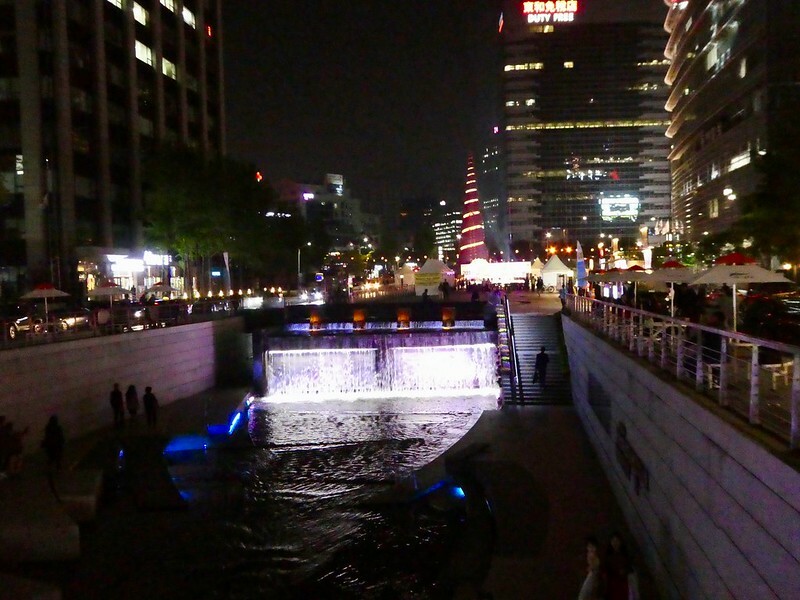 We then enjoyed a walk along the Cheonggyecheon Stream as far as City Hall which looked quite different from the previous afternoon in the moonlight. Ahhh this made me want to hop on a plane right now and fly to Korea! The Starfield Library looks absolutely like a book-lover’s dream!! 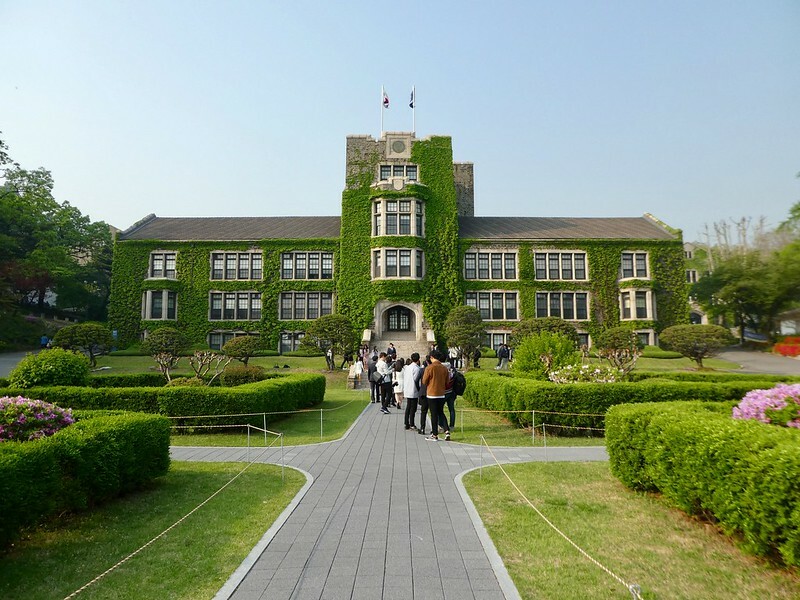 And wow, Yonsei is beyond beautiful!! Thank you for your kind words. 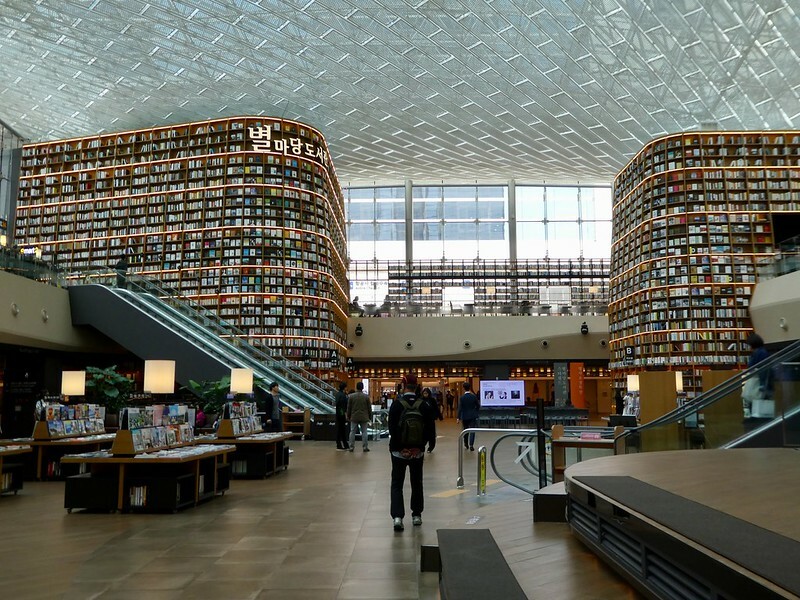 Korea is such a beautiful country and the Starfield Library is definitely a book lovers dream. I enjoy your thoroughly informative posts and very fine photography complementing the text. I am a fan of flowers and it seems your camera also finds them attractive, creating very strong scenes. When you said D’light “… categorised me as insightful, calm and active …” there was no doubt the ‘active’ element was correct, plus your posts are ‘insightful.’ I suppose ‘calm’ was correct until you needed to rush to the General Assembly(! ); I applaud you for making that part of your excursion. Thanks for sharing your Seoul … experience. Thank you so much for your kind words. It’s so gratifying to read that you are enjoying my blog and I enjoyed reading your analysis of my visit to Samsung D’Light. I have greatly enjoyed the tour of Korea that you have discussed in your blog. Thank you for allowing me to share the trip with you! It’s my pleasure, it’s so nice to read that you are enjoying this series of posts! I miss Korea, it’s a beautiful country. If you ever have the chance, I recommend taking the KTX to Dong-Daegu station and take a bus to Palgongsan. The scenery there is wonderful. Korea is indeed beautiful. Hopefully we will have an opportunity to make that trip sometime, thank you for the suggestion. ‘Gangnum Style’ brings back nice memories of the viral popular video! Your crisp description, bits of history and stunning photography make the read very pleasurable. Keep writing. Thank you Veena for your kind words. It’s so nice to read that you are enjoying my series of posts on Korea. Thanks Ramona for your welcome thoughts. Its pleasing to read that you enjoyed my recent Korean post. This post was so fun to read! I haven’t been to Seoul yet but reading your post made the travel bug to itch me. 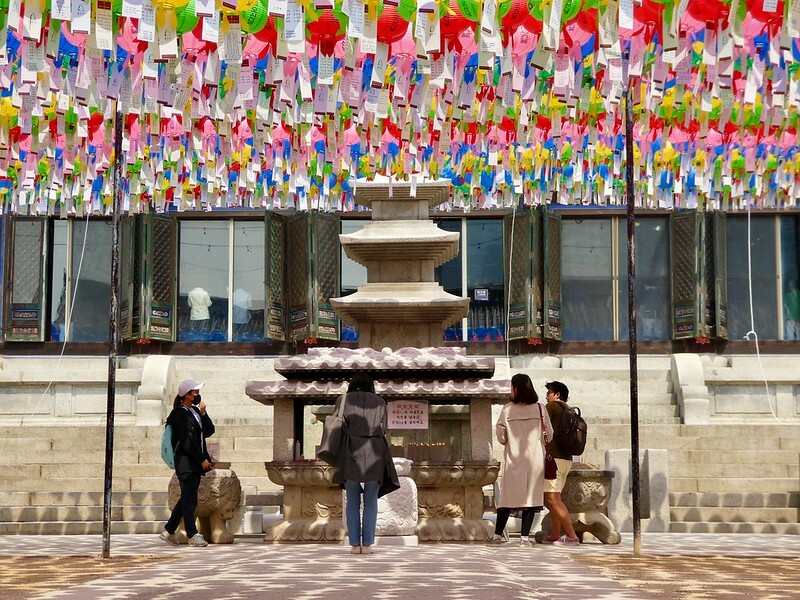 When would it be the best time of the year to explore South Korea? Thank you Lydia for taking an interest in my series of posts on Korea. 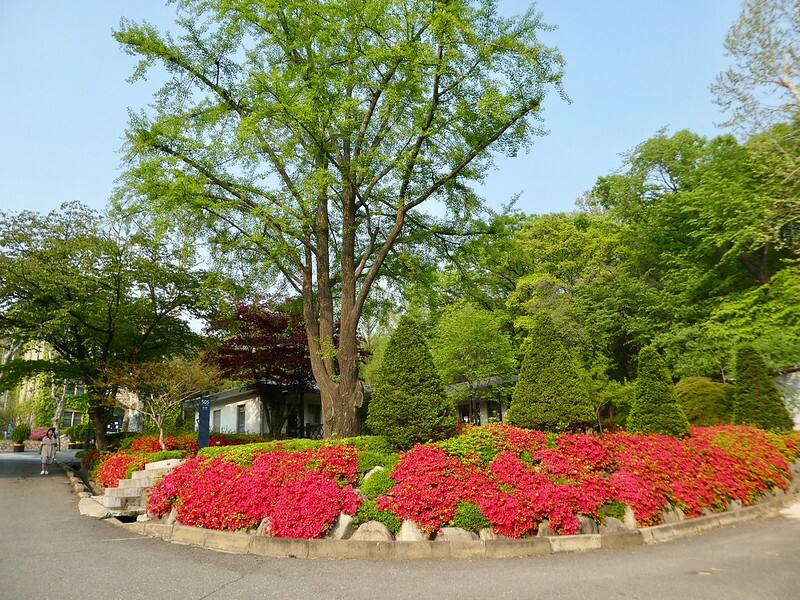 I’m sure you would not a visit and I would recommend April / May when all the azaleas are in bloom, the weather is quite settled and not too hot. Autumn would also be very nice with the changing colours. Thank you Prabha, I do hope you get an opportunity to visit Korea before too long. So interesting! I’d never thought of visiting S. Korea. Thank you for your welcome thoughts Sandra. 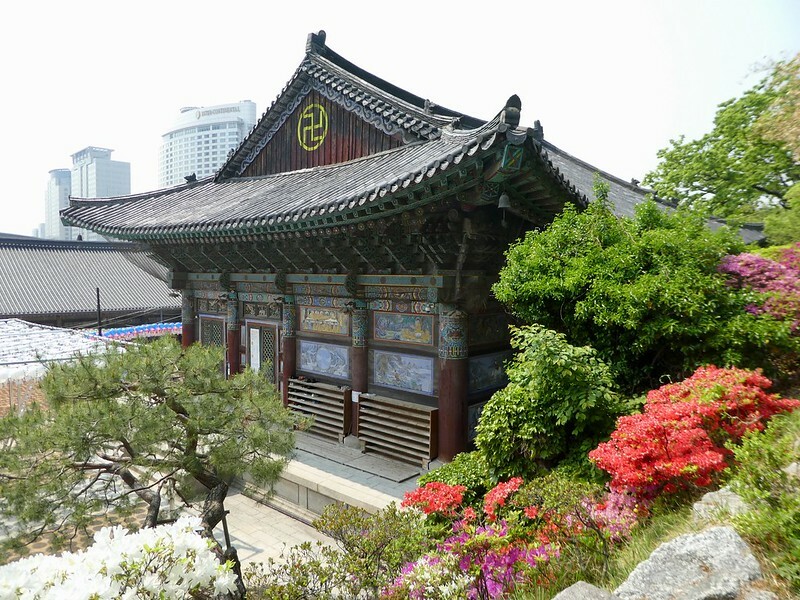 South Korea is a lovely country to visit with so much history and beautiful scenery. Awesome post, and so many beautiful photographs! Thanks for another great Saturday morning read! Thanks Marcus as always for your kind words. Hope you are having a good weekend too! The landscapes and architecture, especially the Assembly building, look so restful. You caught this so well in your pictures. I love all the azaleas. Thanks Marie for your kind words. The university buildings were just so beautiful and so conducive fir learning! It’s my pleasure, enjoy your WordPress journey! You certainly had a most full day! Thank you for showing places in Seoul with which I am not familiar. I walked around the Gangnam area, before the great modern structures appeared. It was mostly wetland, back then. Thank you for taking the time to comment on this post, it’s much appreciated. I’m sure that Gangnam has changed significantly over recent years! Thank you Ayunda the library is stunning and the beautiful university buildings would be such a wonderful place to study! You are such a dynamic, adventurous traveler. I really enjoy the variety of sights and activities you share. Thank you so much Eileen for your much appreciated thoughts on my travels. Thank you Jo. I always love my Asian adventures and Korea definitely lived up to its high expectations. I definitely have to visit! I think you would really enjoy a visit to Korea. It’s absolutely beautiful with so many interesting things to see and do. Thank you for your comments? Thank you again for the many happy reminders of my days spent in Seoul. Did you notice even in their concrete jungles the people tend their street flower boxes lovingly? Thank you for your ever welcome thoughts Ian. Yes, I did notice how much pride the Koreans take in their little balconies which were indeed brimming with flowers. Korea really looks beautiful and your post makes it really lively and wanting to go place. Thanks for sharing and keep travelling. Nice Post. Enjoy. Thank you for your nice comments. Korea is absolutely beautiful and a lovely place for a visit.